At 6:15 a.m. Oct. 23, Travis Morrin got “the scariest phone call I’ve ever received.” Three’s Bar & Grill, the restaurant Morrin and two friends had started seven years ago in Kihei, was on fire. Smoke damage was everywhere. The restaurant closed indefinitely while the kitchen was redone and the soot-covered walls were scrubbed and repainted. Staff pitched in with the reconstruction. After 40 days, Three’s was back in business. 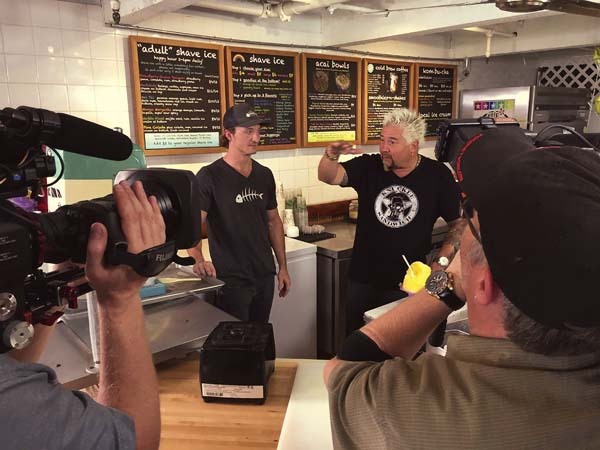 Now the South Maui eatery is in the spotlight for a different reason: being selected for Food Network’s “Diners, Drive-ins and Dives.” Earlier this month, host and celebrity chef Guy Fieri filmed a segment at Three’s during a tour of several restaurants on Maui. Three’s, Down the Hatch, Thai Mee Up, Maui Brick Oven and Maui Fresh Streatery are all set to be featured on the show, though dates have not been released yet. Morrin, Blosser and Cody Christopher were co-workers at another restaurant when they realized their mutual love of surfing. They launched Three’s Catering in 2009 and moved into a permanent space in Kihei’s Kalama Village shortly after. 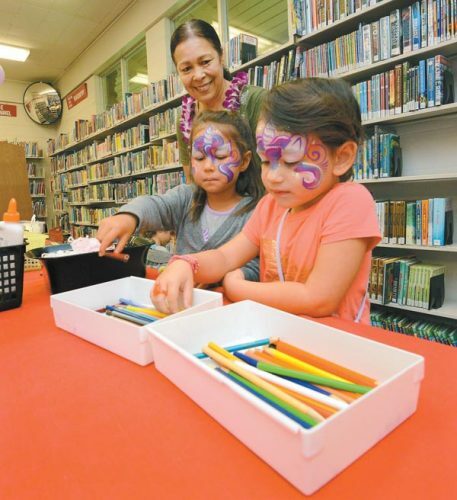 Hawaiian, Southwestern and Pacific Rim cuisines inspire their menu. While Fieri was in town, Morrin cooked the restaurant’s Asian-inspired beer can chicken, made with Maui Brewing Co.’s coconut porter and a citrus-hoisin glaze, and served with bacon-fried brussel sprouts and mashed potatoes. He also made a bowl of Three’s traditional ramen, a 12-hour recipe that features locally made noodles, housemade soy pork dashi broth, vegetables, pork belly and egg. Working with the crew “was like a NASCAR race,” Morrin said. The chefs were on their toes as Fieri sampled their dishes. Last year was full of major changes for the three friends and business partners. In August, they opened a new restaurant in Kihei, Fork & Salad. Then the fire hit, and all the training they’d picked up building Fork & Salad went into repairing Three’s. For Fieri’s visit, Bonfardin whipped up the restaurant’s lobster and crab grilled cheese, “a hearty, rich dish that’s over the top,” Barberi said. Chunks of Maine lobster and blue crab, three different cheeses and a berre blanc sauce are loaded between slices of Home Maid Bakery sweet bread. Bonfardin also made the ahi samurai appetizer, which features pepper-seared ahi pieces on crostini topped with avocado hummus, sprouts, pickled onion, wasabi aioli and a balsamic glaze. Next door, the three have also opened Breakwall Shave Ice Co., which offers a boozy twist to the popular local treat. They served Fieri their mango margarita shave ice with tequila. Down the Hatch’s debut on “Booze Traveler: Best Bars” will air at 7:30 p.m. May 1 on the Travel Channel (cable Channels 325 and 1325). 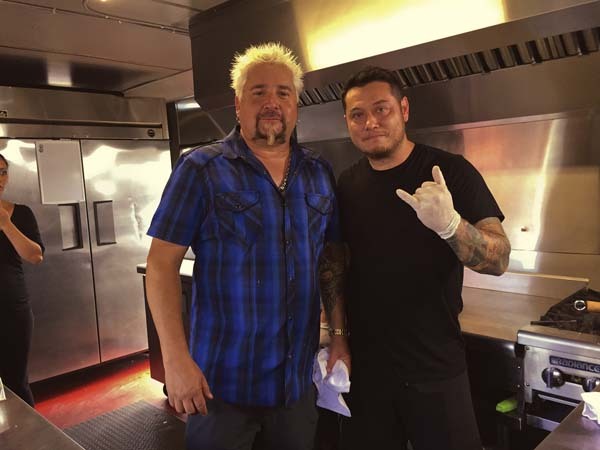 Fieri also stopped by Thai Mee Up, a food truck that Maui-grown Thai chef Tom Sribura opened across the street from Costco in 2015. Sribura’s mom hosted a Thai cooking show on Akaku TV in the 1990s, and Sribura picked up her skills. For Fieri, he served stuffed chicken wings and deep fried pork ribs. The celebrity host asked Sribura to make extra plates of ribs to take home to his family. A year and a half into the business, Thai Mee Up has earned a 5-star rating from customers on Yelp, which ranked the food truck No. 37 in its list of Top 100 Places to Eat in 2017. Business grows each month, and “with the show, it could take off even more,” Sribura said. He’s “stoked” that shows like “Diners, Drive-ins and Dives” bring attention to smaller eateries. Maui Brick Oven, a gluten-free pizza joint in Kihei, and Maui Fresh Streatery, a Kahului food truck dishing out gourmet cuisine, have also posted on social media that they’ll be featured on the show, but the owners have declined comment until after the episode airs.